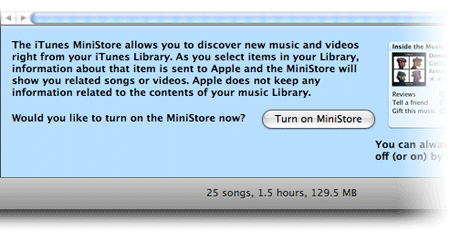 When iTunes 6.0.2 came out during Expo last week, a new feature was quietly introduced—the MiniStore. This is a small version of the iTunes Music Store that lives at the bottom of the iTunes window. As you select (via click or double-click) songs in your Library or playlists, the MiniStore’s content changes to recommend purchases based on your current selection. In order to do this, clearly some information was being sent to Apple. Many Mac users, including myself, were concerned about this, given that Apple hadn’t made any statements concerning whether or not this collected data was kept—and if it was kept, under what situations could it be shared with third parties? Shortly after posting my original Weblog entry, I was contacted by a senior Apple official who indicated that, as I had theorized in the post, no data was being retained. I updated the story and thought “that’s that,” and got back to work on other projects. However, the discussion over this feature continued unabated—as 163 (and counting) comments to the blog entry will attest, it’s a touchy subject with many people. Today, however, Apple quietly took a step that should allay any remaining concerns. This will hopefully (finally!) put this issue to rest, and we can all get back to simply enjoying our music. If you’d like more details on this new feature, Peter Cohen has created a nice writeup for Playlist. I can only hope that Apple has learned what it should have known in the first place—if you’re going to transmit some information from my computer, please let me know that you will be doing so, and what your plans are for the collected data. Had this screen existed in the first release of the MiniStore, then this whole topic would have been a non-issue.